The fourth and final phase of the award-winning River City development, Harris Square takes its name from the public square that it faces. Continuing Saucier + Perrotte’s penchant for bold forms, the building is designed as a series of gyrating pentagonal plates, reflecting the five sides of the site itself, and allowing for oversized balconies and terraces on many floors. Also responding to its context, the building connects Harris Square in front of it with Underpass Park behind by lifting itself up at the ground level, creating a relatively column free 5 metre high open space between the two public spaces. 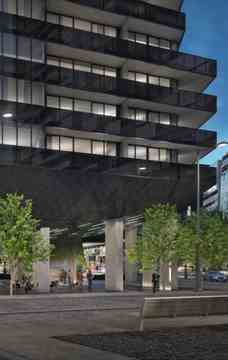 - River City is a four-phase residential development located on one of Toronto’s largest downtown sites. - River City will contain 1,074 residential units and over 1 million square feet of LEED Gold certified development. - The buildings feature efficient heating and cooling equipment, with energy recovery ventilators. - The site is accessible by transit and bicycle. Harris Square Condo has a perfect Transit Score of 100/100 and a Walk Score of 89/100. - All new residents of River City receive a free one-year membership in a low-emitting car sharing program. 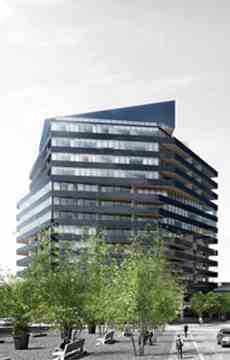 Harris Square Condos is a condo development by Urban Capital Property Group located in the new West Don Lands neighbourhood, Toronto.